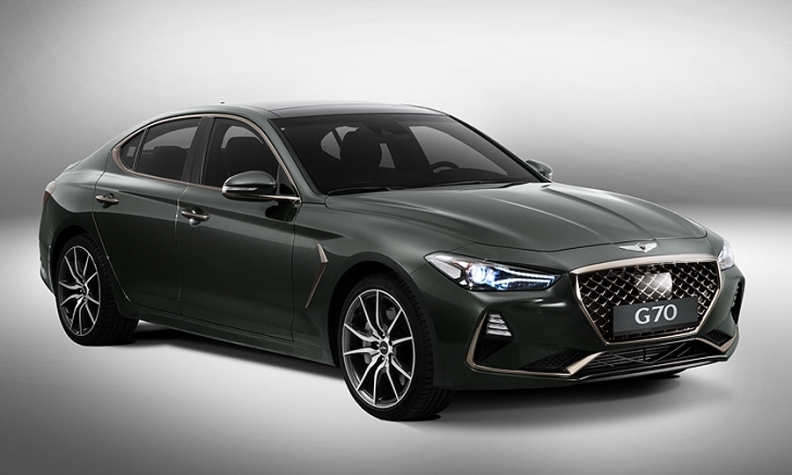 HWASEONG, South Korea -- Genesis, Hyundai Motor Co.'s fledgling luxury brand, is vowing to challenge more established German rivals with the G70, its first compact sport sedan, that will offer optional 3.3-litre V-6 turbocharged performance. The G70's V-6 turbo will sell alongside a base 2.0-litre four-cylinder turbo, while some markets will also get a 2.2-litre diesel variant, Hyundai Canada said in news release Friday. The athletic, entry-level offering is expected to arrive in the United States next spring as a 2019 model after going on sale in South Korea on Sept. 20. Genesis is loading the G70 with advanced safety features, including a highway driving assist function, although that feature is not expected to be offered in the United States. The G70 will go on sale in Canada early 2018, Hyundai Canada said in an email to Automotive News Canada. The G70 fleshes out the sedan lineup of Hyundai's burgeoning marque. Executives say that having an entry-level sedan demonstrates the brand's commitment to compete. "To get substance into your brand, you need to demonstrate the breadth of the band," global Genesis brand boss Manfred Fitzgerald said at Hyundai's r&d centre and proving ground here near Seoul. "We still have a lack of awareness." Alongside the flagship G90 and midsize G80 sedans, the G70 will take on the BMW 3 series, Mercedes C class and Audi A4. Genesis plans to expand the portfolio to six nameplates by 2021 by adding crossovers, and it plans to enter new markets. "The G70 is our smallest, most dynamic sedan," said Lee SangYup, vice president for design at Hyundai and Genesis. "Our mission is to target the German 3." The U.S. luxury compact car segment is one of the industry's most crowded -- the Jaguar XE is the latest entry -- and hotly contested: It is dominated by the Mercedes C class, BMW 3 series, Infiniti Q50 and Audi A4. The segment generated annual sales of just over 500,000 units as recently as 2014 and 2015 but has shrunk 9.2 percent this year after a 14 percent decline in 2016. Still, the G70 is expected to deliver more volume for a nascent luxury brand that has become a bright spot for the otherwise struggling Hyundai Group in the United States. While U.S. sales have slipped 15 per cent at Hyundai and 8.4 per cent at Kia, through August, Genesis has racked up deliveries of 13,366 behind just two car models -- the G80 and the G90 -- in a market that has shifted decidedly to crossovers and SUVs. Hyundai Canada sales are down 8.9 per cent to 91,599 vehicles through August while total Kia sales are up 4.8 per cent to 51,932 vehicles. Genesis has sold 328 cars in Canada through eight months. 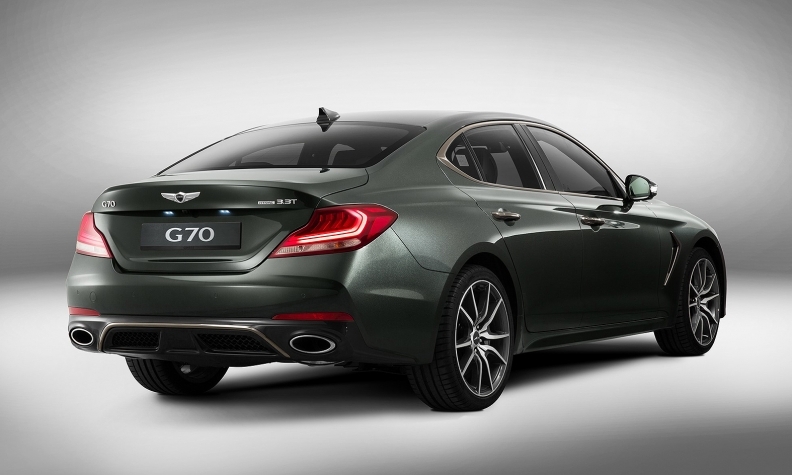 The G70's design, with its athletic rear-wheel-drive stance, was chosen through a global competition among studios in South Korea, Germany and the United States. The Frankfurt studio snagged the win. The G70 introduces several new Genesis-brand design cues. Among them is a new shield-shaped grille with a pointed bottom. While Mazda and Alfa Romeo also have pointed shield grilles, Lee said Genesis' point dives deeper. Another new flourish is the G70's quad headlights, composed of thin slivers of LEDs that meld into the main light. They will evolve to be a brand signature in future nameplates, according to the company. Both the pointy-shield grille and double-line quad headlamps will be carried over to the G80 sedan, which is expected to receive a full model change around 2019. The G70 shares a platform with the new Stinger from Hyundai Motor Group sibling brand Kia, but the Genesis model uses a more conventional sedan profile than the Kia. Inside, the car eschews wood trim for brushed aluminum. Designers said wood would be reserved for the more upmarket G80 and that the sportier G70 needed a more high-tech feel. Quilted leather door panels and Nappa leather seats exude a premium aura. An 8-inch touch screen display supports MirrorLink, Apple CarPlay and Android Audio. The G70 offers five pre-programmed driving modes, including comfort, eco and sport settings. Available in rear-wheel drive or all-wheel drive, the G70 will come with either a 2.0-litre turbocharged four-cylinder engine or a 3.3-litre turbo V-6 for the U.S. market. The United States will not receive the diesel, and Hyundai said it currently has no plans for an electrified version. The 3.3-litre V-6 generates around 365 hp and does 0 to 62 mph (0 to 100 km/h) in 4.7 seconds, Genesis said. It has a top speed of 167 mph. The V-6 rear-wheel drive delivers the equivalent of 21 mpg (11 litres per 100 km) under Korean fuel economy standards. The rear-wheel-drive four cylinder gets the equivalent of 25 mpg (9.4 litres per 100 km) under the measurement. The company did not release EPA ratings. Standard features on all models include launch control to maximize power control when accelerating, rack-mounted power steering for precise handing, multilink rear suspension for comfort and dynamic torque vectoring to improve corning. The G70 also gets a mechanical limited slip differential to improve performance in rain, snow and other slippery conditions. Safety technology in the Korean market will include forward collision avoidance assist, highway driving assist, blind spot detection and a driver awareness monitor. The brand packages the systems together under the banner Genesis Active Safety Control. Genesis vehicles are currently sold only in South Korea, the United States, Russia and the Middle East. Fitzgerald said Genesis will weigh entry to China and Europe in the next couple of years. The G70 sedan is expected to be followed by a coupe iteration, likely for the 2020 model year. "There are many other white spots on the map," Fitzgerald said about holes in the lineup. With an eye toward Genesis' entry to Europe, Lee said product planners are contemplating a wagon variant of the G70, codenamed the IK Shooting Brake. Lee said the concept was inspired by the old Porsche 928.